Considered a premiere receiver coming out of the SEC, a broken foot derailed Keon Hatcher’s aspirations for the NFL. Granted a 5th year medical redshirt, Keon returned to the lineup and led the Razorback receiving corps. He finished his 5 years with Arkansas with 130 receptions for 1866 yards and 19 TDs. His combine results drew comparisons to former Texans receiver Jalen Strong. Hatcher was not selected in the 2017 NFL Draft. 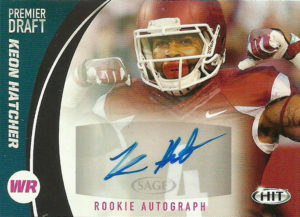 He signed as a free agent with the Oakland Raiders, and caught a spectacular pass from EJ Manuel during the preseason. Although he was cut by the Raiders, Hatcher impressed enough during camp that he was brought back to the teams’ practice squad. Keon had an outstanding 2018 preseason, catching 3 TDs in the preseason finale. He made the roster but was cut after the first game in favor of Martavius Bryant. The Lions signed him to their practice squad about a week later, but he was released the following day. Currently Keon is a free agent.